Mr. Miiracle aluminum 9inch round pan is disposable, and can be used to hold and serve food. Aluminum foil containers hold in heat, serve as a moisture and oxygen barrier for freshness, and can be recycled. Unlike other aluminum foil pans, ours is made with heavy-duty aluminum for strength, ease-of-use, and re-use! Bake your favorite dish, and you can easily freeze or carry it along to share with friends and family. These pans are ideal for small Take-Out, Side Dishes, Pastries, and Food Service, and work great for hot or cold food. 9 inch foil steam table pan is made of durable quality aluminum foil and features a full curl rim. The curled rim provides rigidity and can be held or gripped. These pans are not pie shaped they are flat bottomed which makes baking and reheating very easy! 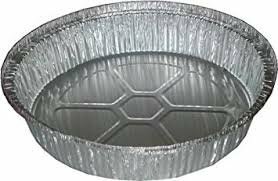 Aluminum Foil, impervious to light, moisture and odors, is ideal for the food service. Perfect for household, takeouts and catering. Can be used for warming appetizers, baking small goodies and roasting food. Pack of 50 Pans - Durable Quality. Dimensions: Top 9" Bottom 7.5" Height 2"
If you have any questions about this product by Mr Miracle, contact us by completing and submitting the form below. If you are looking for a specif part number, please include it with your message. DOBI (15-Pack) Full-Size Deep Chafing Pans - Disposable Aluminum Foil Steam Table Deep Pans, Full Size - 20 1/2" x 12 1/2" x 3 1/4"